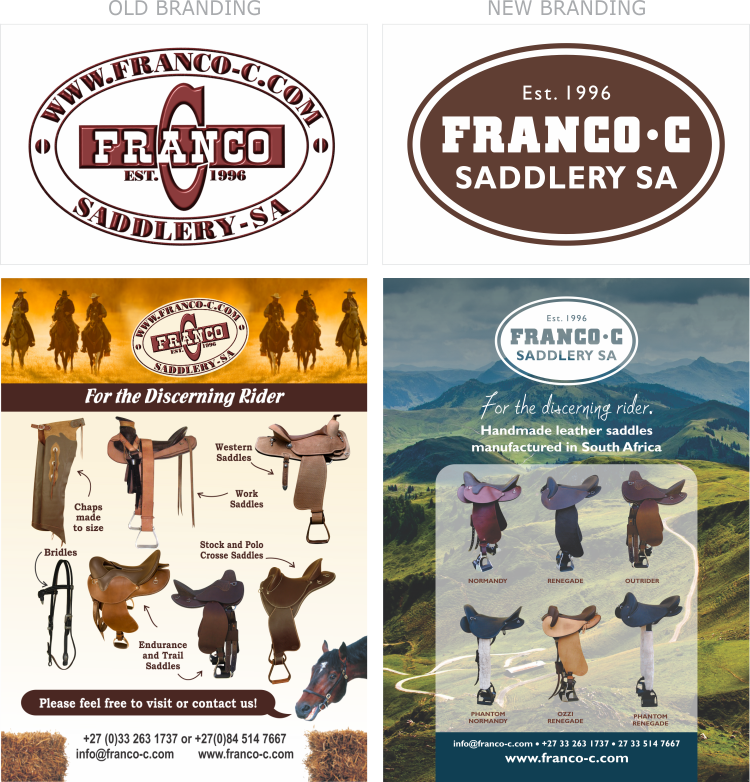 Franco C Saddlery manufactures saddles. We've been doing their advert design for quite a number of years but their logo has become outdated. So we've helped them bring it up to speed by creating a new one for them, and also modernising their look. Their old logo (on the left), originally created by the client, had a 3D 'plastic' fill effect which, besides being an outdated design mode, made it a problem when the logo need to be enlarged as, being a pixel-based jpg image, it lost quality. It was also difficult to make out at a glance that the company name was 'Franco C'. And their website address should not have been part of the logo. The new Franco C logo (on the right) is modelled on the old one but is more streamlined, easier to read, and has a wider application because it can be enlarged to any size without losing resolution - it looks great in a single colour too and can now be superimposed over any background, which wasn't possible with the old version of the logo. The palette of Franco's old advert design (on the left) was made up of earthy tones, with individual design elements like the 'cowboy' banner, the haybales and the horse to bring in the 'outback/ranch' theme. We felt this limited their advertising to a niche audience so we suggested using single, bold imagery related to riding but that would appeal to a wider audience as it invokes nostalgic feelings of exploring beautiful wide open spaces (like our own Drakensberg) on horseback. Their new advert design on the right is the result! We can't wait to recreate all Franco C's advertising with their new look.